Everything you need to know about Thunderbolt. USB 1.0 consolidates and simplifies low‐speed data ports. USB 2.0 increases data speed (480 Mbps). USB 3.0 increases data speed (5 Gbps). 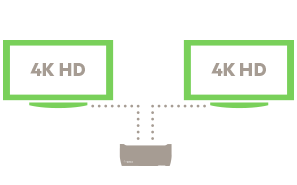 Thunderbolt consolidates and simplifies high-speed data and video ports (10 Gbps). Notebooks featuring Mini DisplayPort are announced. 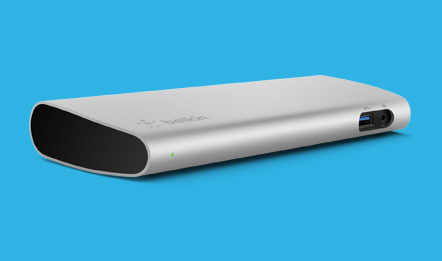 Thunderbolt 2 increases data and video speed (20 Gbps). USB 3.1 increases data speed (10 Gbps). More devices featuring Mini DisplayPort are announced. Type-C (USB-C) connector introduces a new small, reversible connector. 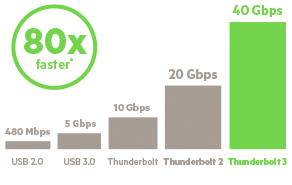 Thunderbolt 3 brings Thunderbolt and USB 3.1 (10 Gbps) to USB-C (40 Gbps). The increasing mobility of the workforce coupled with the decreasing size of devices created a challenge within the tech sphere: How to support desktop speeds and applications—on mobile devices. Thunderbolt was developed as a solution to this challenge. Up to 8x faster than USB 3.0, Thunderbolt 3 technology supports the fastest data and most video bandwidth on a single cable. Streamline your workspace with Thunderbolt, technology designed to enable desktop-level performance on a mobile computer. 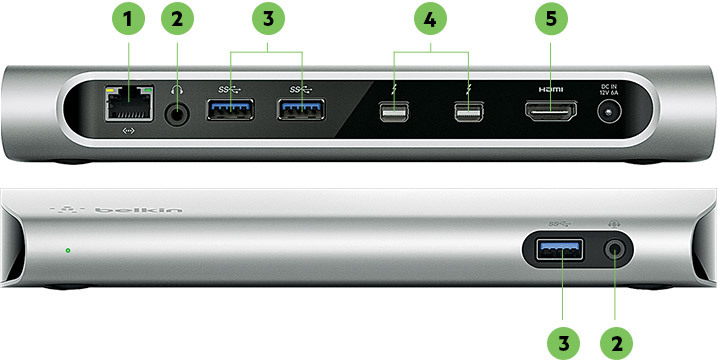 Need to simplify your workspace with Thunderbolt™ 2 (Mini DisplayPort)? The Thunderbolt 2 Express Dock HD connects to 8 separate devices, supports dual displays and 4K resolution, and transfers files at up to 20 Gbps. 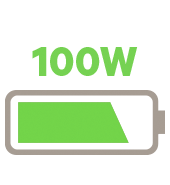 Want more power for your MacBook using Thunderbolt™ 3 (USB-C)? The Thunderbolt 3 Express dock has 2x the speed of Thunderbolt 2 and 85W of power, giving you the power of a desktop—in your laptop. Take full advantage of Thunderbolt technology with attach products from Belkin. A unit of data transfer rate measuring bandwidth speed by the billions of bits transferred per second. 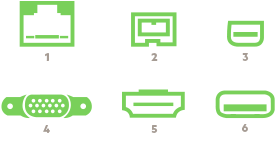 The most common universal connector on the “other end” of most current USB cables, Standard USB is often suitable for use with computers, car chargers, wall chargers, and many other devices. A port designed for use with an industry standard connector to communicate data and supply electric power between devices. USB 3.1 is the updated, Gen 2 version of USB 3.0. Gen 2 successfully doubled the transfer speed rate of Gen 1(USB 3.0), taking USB from 5 Gbps to 10 Gbps. A new type of USB connector, hailed as the new standard. Smaller, faster, and more user-friendly than previous USB types, USB-C has widespread support from industry leaders, meaning USB-C will come to replace all other USB types. A non-profit organization founded by the companies that developed the Universal Serial Bus (USB) specification. The USB-IF’s mission is to support and advance USB technology. Quickly becoming the new standard for high-quality digital video, 4K refers to a horizontal resolution of 4,096 pixels, or “4K” pixels. A miniaturized version of the DisplayPort interface, Apple developed audio-visual digital interface Mini DisplayPort in 2008. Second display must be Thunderbolt enabled.